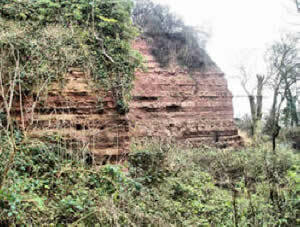 Colwick Cutting is the only Geological SSSI within Nottingham City Council boundary. 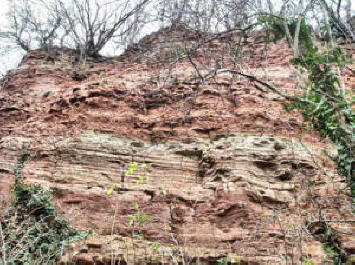 This site is the type section of the Triassic Colwick Formation, a major rock unit comprising mudstones, siltstones and thin sandstone arranged in coarsening-upwards units. A variety of sedimentary structures including ripple marks, wavy bedding, halite pseudomorphs and abundant desiccation cracks are seen. The facies probably represents marine intertidal conditions an environmental interpretation consistent with the discovery of the brachiopod Lingula elsewhere in the formation. The age of the formation is probably Anisian-Ladinian and it can be correlated with other ‘Waterstones’ facies in the English Midland. The remains of the Ice House are hidden at the moment by overgrown shrubbery. The brickwork below ground is in reasonable condition but the “roof” has completely disappeared. We believe the roof was of a dome shape brick construction spanning 3 1/2 metre. This supposition was deduced from an inwards slopping layer of brick work around the perimeter. We are continuing our research into the original structure and are progressing slowly but hope eventually to recreate this piece of history. From research carried out by Friends of Colwick Woods group, and as seen in the photograph taken by Mr Alfred Woolrich in 1986 and recent photographs by Mr John Davies in 2007, we can see the inward slope of the now top layer of brickwork which leads us to believe the roof of the Ice House was of a dome construction. The entrance can be seen in the 1986 photo where a section of brickwork approximately 1 metre wide is missing. From measurements taken of the circular brick structure the diameter is 3.5 metre. 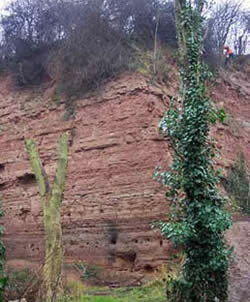 We have as yet to determine the depth of the structure, as only 1.5 metre of brickwork can be seen below ground level. The remainder is currently filled with soil and rubble (possibly the remnants of the collapsed roof). There is also a pipe which we believe extends from the base of the Ice House to a gulley, which allowed drainage of the melted ice.We believe the Ice House was constructed in the then grounds of Colwick Hall Estate, of which Colwick Woods was part. Research is still ongoing.